The sense of hearing is of paramount importance in spoken communication, and age-related hearing loss can lead to porblems with communication, decreased awareness of environmental clues and even social isolation. Histologic changes associated with aging occur throughout the auditory system from the hair cells of the cochlea to the auditory cortex in the temporal lobe of the brain. The international incidence of impaired hearing in the elderly varies among societies, but most of the world's population experiences some degree of decline in hearing with advancing age. In the USA approximately 25-30% of people aged 65-74 years are estimated to have impaired hearing. For people aged 75 years and older, this incidence is thought to rise to 40-50%. A UK study found that 80% of hearing impaired people are over the age of 60. Sound signals travel from the ear to the brain where they are recognized and decoded. Enunciate clearly - don't mumble! If in a noisy hospital setting, can you find a quieter spot to treat them in? Use written instructions for specific exercises - but make sure the print is large enough (suggest maybe font size 14) as elderly people frequently have visual limitations too and are unable to read small print (see Eyesight in the Elderly page). Also, do include pictures. The outer ear includes the portion of the ear that we see—the pinna/auricle and the ear canal. The pinna or auricle is a concave cartilaginous structure, which collects and directs sound waves traveling in air into the ear canal or external auditory meatus. The ear canal directs airborne sound waves towards the tympanic membrane (eardrum). The ear canal resonates sound waves and increases the loudness of the tones in the 3000-4000 Hz range. The ear canal maintains the proper conditions of temperature and humidity necessary to preserve the elasticity of the tympanic membrane. Glands, which produce cerumen (earwax) and tiny hairs in the ear canal, provide added protection against insects and foreign particles from damaging the tympanic membrane. The tympanic membrane or eardrum serves as a divider between the outer ear and the middle ear structures. It is gray-pink in color when healthy and consists of three very thin layers of living tissue. The eardrum is very sensitive to sound waves and vibrates back and forth as the sound waves strike it. The eardrum transmits the airborne vibrations from the outer to the middle ear and also assists in the protection of the delicate structures of the middle ear cavity and inner ear. The middle ear cavity is located in the mastoid process of the temporal bone and extends from the tympanic membrane to the inner ear. It is approximately two cubic centimeters in volume and is lined with mucous membrane. The middle ear cavity is actually an extension of the nasopharynx via the eustachian tube. 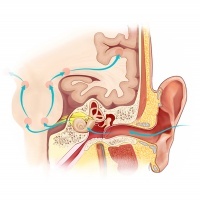 The eustachian tube acts as an air pressure equalizer and ventilates the middle ear. Normally the tube is closed but opens while chewing or swallowing. When the eustachian tube opens, the air pressure between the outer and middle ear is equalized. The transmission of sound through the eardrum is optimal when the air pressure is equalized between the outer and middle ear. When the air pressure between the outer and middle ear is unequal, the eardrum is forced outward or inward causing discomfort and the ability of the eardrum to transmit sound is reduced. The middle ear is connected and transmits sound to the inner ear via the ossicular chain. The ossicular chain amplifies a signal approximately 25 decibels as it transfers signals from the tympanic membrane to the inner ear. The ossicular chain consists of the three smallest bones in the body: the malleus, incus, and stapes. Attached to the ossicular chain are two tiny muscles, the stapedius and tensor tympani muscles. These muscles contract to protect the inner ear by reducing the intensity of sound transmission to the inner ear from external sounds and vocal transmission. The balance mechanism of the ear is known as the vestibular apparatus. It comprises three semicircular canals located within the inner ear. The vestibular system helps to maintain balance, regardless of head position or gravity, in conjunction with eye movement and somatosensory input. The semicircular canals are innervated by the VIIIth cranial nerve. 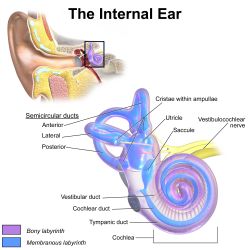 The hearing part of the inner ear is the cochlea, which is a spiral-shaped structure, similar to the shape of a snail. The cochlea comprises three fluid-filled chambers, the two outer chambers are filled with a fluid called perilymph. Perilymph acts as a cushioning agent for the delicate structures that occupy the centre chamber.Perilymph is connected to the cerebrospinal fluid that surrounds the brain and the spinal column. The third fluid filled chamber is the centre chamber, called the cochlear duct. The cochlear duct secretes a fluid called endolymph, which fills this chamber. The cochlear duct contains the Basilar membrane upon which lies the Organ of Corti. The Organ of Corti is a sensory organ essential to hearing. It consists of approximately 30,000 finger-like projections of cilia/hair celss that are arranged in rows.Each cilia is connected to a nerve fibre that transmits impulses to the cochlear branch of the VIIIth cranial nerve or auditory nerve. The "pitch" of the impulse relayed is dependent upon which areas of the basilar membrane, and hence, which portions of the Organ of Corti, are stimulated. The apical portion of the basilar membrane (the most curled area of the cochlea) transfers lower frequency impulses. The basal end relays higher frequency impulses. The VIII cranial nerve, AKA Acoustic or Auditory nerve, carries the impulses generated from the Organ of Corti to the brainstem. From the brainstem, nerve pathways extend through numerous nuclei to the cerebral cortex in the temporal lobes of the brain. It is in the temporal lobes of the brain that meaning is associated with the various patterns of nerve impulses. For more details on the Acoustic Nerve please see the Acoustic Neuroma page. Presbycusis is the term for an age-related hearing loss. Sensorinerual hearing loss is an interruption/degredation of the conversion of sound waves to electrical signals by the inner ear, or an interruption of the nerve impulses to the brain, which commonly occurs as we age; but in addition there is often an element of Conductive hearing loss too, which results from a more mechanical dysfunction of the outer or middle ear. This is a result of degeneration of the cilia/hair cells at the basal end of the organ of golgi. This is due to degenrative changes in nerve fibres within the cochlea and neuron loss along the auditory pathway. ↑ Epidemiological profile of hearing impairments: the scale and nature of the problem with special reference to the elderly.fckLRDavis ACfckLRActa Otolaryngol Suppl. 1990;476:23.